Behavioral shifts among consumers in the audio industry have been highly influenced by the growing penetration of smart phones and tablets. This, combined with the changing preference in media consumption toward streaming services such as Deezer, Pandora, and Spotify, will boost the prospects of the global wireless audio devices market at a CAGR of 1.5% between 2014 and 2024, finds Transparency Market Research (TMR). Wireless audio devices enable access to huge personal libraries of songs for listeners to enjoy at home or on the go. The advent of this technology has not only steered paradigm shift in consumer preference but has also catapulted wireless and portable MP3 players at the forefront of the music and entertainment industry. Besides this, latest innovations in the wireless audio technology have caused a major shift in music storing and music streaming technologies. The launch of smartphones, tablets, and other smart devices in-built with high-tech players has replaced dedicated MP3s, thus resulting in a sharp decline in their average sales. The purchase decision of any customer is not only influenced by the audio performance of a wireless audio device. Manufacturers are therefore required to focus on bringing both audio features and ergonomics of devices at an equilibrium to positively influence a consumer’s buying decision. Taking cue from the changing consumer preferences, Clip+ and Micro were launched by JBL and Divoom launched Bluetune Bean that provide additional features alongside exceptional music streaming features. Gaining from the demand for increasing functionality and better aesthetics, the global wireless audio devices market is poised to reach US$10.12 bn by 2024, from US$9.04 bn in 2014, states Transparency Market Research. The rising demand for infotainment in the automotive industry has translated into increased sales of wireless audio devices. The demand for wireless audio devices in the automotive industry also gains momentum from high adoption of the Internet of Things (IoT). Deployment of the IoT in automobiles is fast replacing buttons and knobs used to access and control audio devices with the Bluetooth connectivity. As per TMR’s research, approximately 22% of the world’s cars will be connected to the internet by 2022. This will subsequently propel growth of the global connected wireless audio devices market. Furthermore, with the IoT successfully penetrating across diverse consumer electronics, prospects for wireless audio devices in the automotive industry and household sector seem plenty. 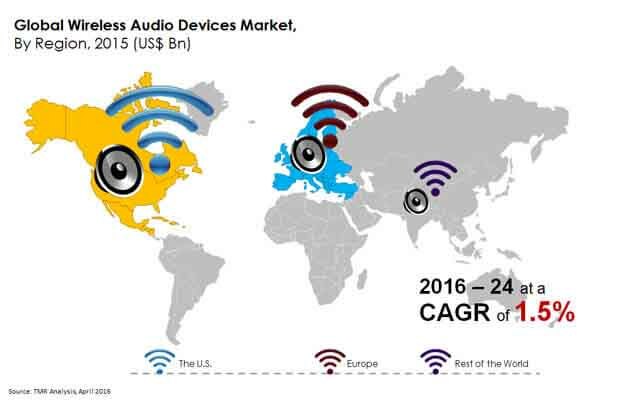 The U.S. and Europe have been exhibiting the most lucrative prospects for the global wireless audio devices market. The growth of digital music has been unprecedented in the U.S. Compelled by the prevailing dynamics, vendors in the U.S. wireless audio devices market are revamping the products they offer to tap into the digital music sources. Prominent suppliers in the market have already added home network technology to their products such as AV receivers, tabletop stereo systems, tabletop radios, home-theater-in-a-box systems, and others. The new technology allows these devices to stream music from networked PC via Wi-Fi. The U.S. has always been the earliest adopter of any novel technology, thus providing comparatively better opportunities for the large-scale deployment of wireless audio devices. In Europe the market will gain from the increasing demand for smart homes. The wireless audio devices market in Europe is likely to surge at a moderate pace during the forecast period. Enterprises operating in the global wireless audio devices market are increasingly focusing on expanding their reach in emerging economies such as India and China, considering the robust demand witnessed in these nations. Apart from this, product innovation and differentiation are also looked upon as viable strategies for attracting positive consumer response. This trend led to the launch of streaming protocol service called “Google Cast” by Google in 2015. Next in line was LG Electronics Inc., who announced the launch of novel sound bars and multirooms in 2016. Wireless audio devices use audio technologies such as Wi-Fi, Bluetooth, Airplay, and WiSA to play the music sourced from a computer or other portable devices. These devices are commonly available in the form of Bluetooth speakers, Wi-Fi multiroom speakers, and sound bars. The increasing inclination towards streaming services such as Pandora, Deezer, and Spotify is driving the global wireless audio devices market. The widening base of youth population is positively impacting the growth of the market. According to a report by Transparency Market Research, the global market for wireless audio devices is expected to exhibit a CAGR of 1.5% between 2016 and 2024, reaching a valuation of US$10.12 bn by 2024. The report offers a detailed analysis of the various critical parameters of the market, making it a reliable tool for business for existing as well as new players. The growing popularity of wireless technology enabled products is providing a significant boost to the global demand for wireless audio devices. These devices are being increasingly acknowledged for their compact design and convenience offered by them. The spiraling demand for infotainment in the automotive industry is augmenting the growth of the global wireless audio devices market. In addition, the increasing implementation of the Internet of Things (IoT) in automobiles and is working in favor of the market. Despite an array of favorable factors, the incompatibility of the Bluetooth technology with high resolution uncompressed audio files is acting as a major impediment to the growth of the market. Moreover, the high susceptibility of the sound quality in Wi-Fi technology to the ambient noise is limiting widespread adoption of wireless audio devices, particularly in the household sector. The rising penetration of smartphones, tablets, and other smart devices with inbuilt high-tech players is also adversely affecting the sales of dedicated MP3. However, the hospitality and leisure industries are likely to provide a fertile ground for the growth of the market. Furthermore, rapid advancements in wireless audio technologies are unfolding ample growth opportunities for the market. The regions analyzed in the report are the U.S., Europe, and Rest of the World. The U.S. will continue to account for the leading chunk in the revenue pie throughout the forecast period. In the U.S., the robust growth of the digital music industry and the increasing focus of wireless audio devices manufacturers towards revamping their offerings are providing significant momentum to the market. The early acceptance of novel technologies along with the incorporation of home network technology to products such as tabletop stereo systems, AV receivers, home-theater-in-a-box systems, tabletop radios, and others is also escalating the growth of the region. The Europe market for wireless audio devices market is expected to post a moderate growth rate during the forecast period. The growth of the region can be attributed to the burgeoning demand for smart homes. Players in the global wireless audio devices market are focusing towards capitalizing emerging countries such as India and China in order to maximize their profit. Apart from this, enterprises are paying high attention to product innovation and differentiation to enhance their visibility in the market. The prevailing prospects of the market are attracting large technology firms such as Google to invest in this market, thereby intensifying the competition in the near future. Some of the other prominent companies operating in the market are Bose Corporation, LG, Sony Corporation, Denon, and Samsung Electronics Co. Ltd.